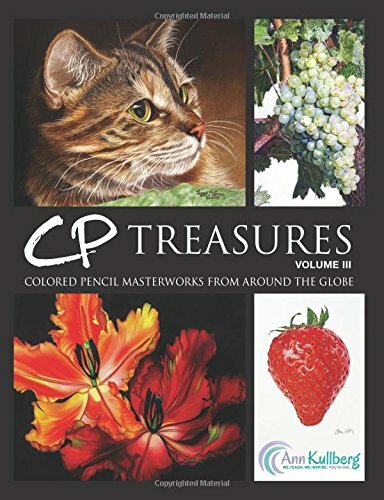 CP Treasures is an annual artbook the collects the best of coloured pencil works from artists around the work. This is the third volume, the first one from the series that I have. Volume 1 was published in 2012 and Volume 2 in 2013. Ann Kullberg, a coloured pencil artist and the editor of this book, had mailed me this book for a review. Currently, I'm into learning (slowly) coloured pencils and this is an inspiring book to check out. There are over 90 beautiful detailed coloured pencil works featured in this 98-page paperback. The book is printed by CreateSpace, one of those on-demand printers. The paper stock is slightly thinner and the colours at least came out quite alright. The artworks look wonderful. It's pretty incredible what some of the artists can create with the medium. There are almost photo-realistic depictions when seen from afar but when looked closely it's obvious they are created from traditional medium that's evidenced by the pigment of the coloured pencils and grain of the paper. Every piece of work is listed with the brand of coloured pencils used, and the paper. There's also a description about the piece, and a brief section tips and techniques used by the artist. The artworks are inspiring and shows the full potential of the medium. It's a great book for aspiring coloured pencil artists and those who love the medium.